A sword through the heart, betokening a love conquered and forever held. 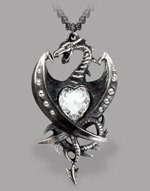 The reverse of this duo-pendant is engraved with the words "Love Rules His Kingdom Without A Sword". This pewter "his & her" codified necklace splits into two separate pendants. 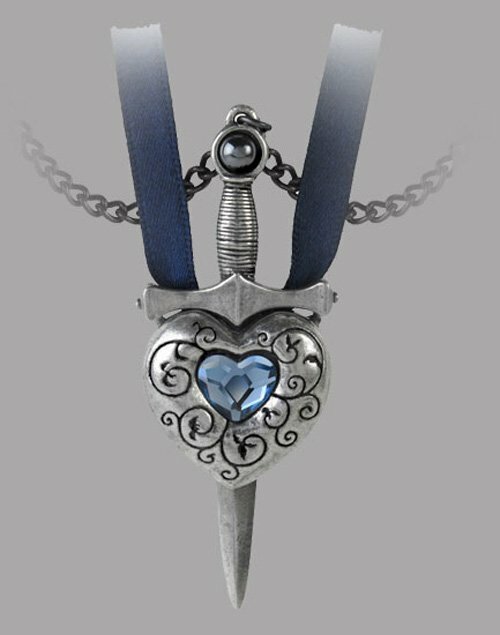 One being a floral scroll-engraved heart set with a pale blue Swarovski crystal on dark blue satin ribbon. 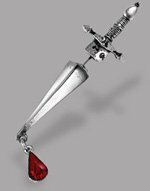 The other, a sword with a hematite cabochon on a black curb chain. 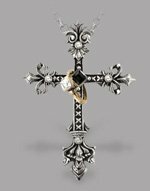 The inscription is engraved across both pieces, becoming illegible when separated and can therefore be worn apart as secret tokens of love or betrothal. The heart's ribbon is 21 inches long and fastened by a 1½" adjuster chain. The sword's chain is 21 inches long with a carabineer fastener.